For all intents and purposes, the Firebirds appear to be back to their dominant form. After a stumble in week one against Olathe East, Lawrence Free State has come together much better as a unit, and their stats speak for themselves. Their 560 yards of total offense against SM North on Friday speak to how stellar of an offense they have this season. The Cougars were beaten up pretty good against Olathe North in week two. Their latest performance against Lawrence is a pretty good indication that they put the beatdown behind them. Dominant play from John Hauk and Matt Nowak will obviously do wonders for the Cougars the rest of the season. The Hawks have probably played the toughest schedule to date (Free State, SM West, and Olathe South). The fact that they came out of that stretch with a 2-1 record speaks volumes, especially given the fact that they returned very few starters on both sides of the ball. Now they get to take on Olathe North. The Pioneers failed to score against SM West, while giving up 49 points. They have now been outscored 6-161 on the season. Unless some drastic changes take place, this Leavenworth team is on pace to be one of the worst teams in Sunflower League history. The Indians had an impressive 2-0 start to the season come to an abrupt jolt on Friday, after they lost to Free State 56-14. SM North can go one of two ways from here on out, and it will be interesting to see how they respond to the big loss. After an impressive victory in week one, the Ravens have been disappointing, now sitting at 1-2. It's not so much that they lost to a dominant Olathe North team on Friday, but rather the fact that they seemed to play uninspired football in the game--their homecoming against a rival opponent. 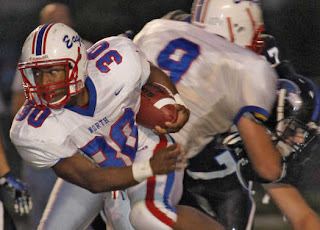 **Olathe North's James Franklin (above) broke the school record for rushing yards in a game with 340 against Olathe Northwest. When you consider the great running backs that have gone through Olathe North (Darren Sproles, Maurice Mack, Beno Gore, Jim Bouknight, Josh Gore, etc. ), you begin to realize how impressive of a feat his 340 rushing yards were. To compliment the yardage total, Franklin added 4 rushing touchdowns. **Lawrence Free State running back Kirk Resseguie rushed for 193 yards and four touchdowns. **SM Northwest quarterback Matt Nowak returned to form Friday night, completing eight of 11 passes for 168 yards, and rushing for 107 yards and a touchdown. **Olathe East running backs Brandon Willingham and Hayden Groves combined for 418 rushing yards and five touchdowns. 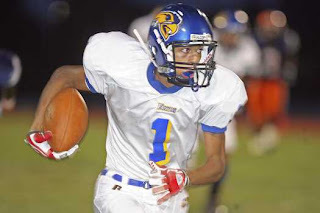 **Olathe South receiver Marquis Addison (below) caught nine passes for 147 yards in his team's loss. At the half he had totalled 102 yards on five catches. 1. Olathe North (3-0): The Eagles continue to roll, and have now outscored their opponents 152-31. 2. SM West (3-0): The Vikings finally showed off some of their offensive abilities in a dominating victory. 3. Olathe East (2-1): The Hawks looks to have found their niche with the running back duo of Brandon Willingham and Hayden Groves. 4. Lawrence Free State (2-1): Firebirds are regaining the form that carried them to a 6A title game appearence in 2008. 5. SM Northwest (2-1): Ultimately the play of quarterback Matt Nowak will dictate just how well the Cougars perform on a weekly basis. 6. Olathe South (1-2): Although their passing numbers were impressive, the Falcons blew another large lead in their loss on Friday night. 7. SM North (2-1): Friday's blowout loss to Free State should come as a wake up call to the squad from Merriam. 8. SM South (2-1): Raiders notch another nice victory, but until they beat a team that isn't winless, it will be tough to gauge their success. 9. Olathe Northwest (1-2): Ravens have been disappointing the past two weeks, but can make up for it against SM South this Friday. 10. Lawrence (0-3): The Chesty Lions play the 0-3 Lancers of SM East this Friday. Somebody has to come away with the victory. 11. SM East (0-3): See Lawrence. 12. Leavenworth (0-3): Being outscored 6-161 is embarrassing, but allowing the all-out beatings to continue would be worse. ON-OE: Most media types think no one will come within 14 points of the Franklin wrecking crew. But with 5 of their next 6 games against OE, LFS, BV, OS and BVW, they're going to have to prove it on the field. This will be closer than they think. ON 28 OE 21. Interesting picks...I was hearing that Humphrey's was going to be good to go against Lawrence Free State...is that not true? I'm not sure...he was out 2nd half against LV and I heard they thought he had a broken knuckle on his right hand during the game but haven't heard anything since. Vikes will need his run support to stop the Torendon attack I think. SMW only given up 3 second half points this year..if they can get off to a better start their D could win this game. Drew has been practicing all week. No ill effects. West has a few tricks this week. I can't wait to see. score will be 28 to 20. West will win on the strength of the running game on 1st and 2nd down and the quick pass on the flats on 3rd down. and just for fun a couple long post passes. Defense is a bend don't break. here we go, State.